“Paths of Glory" is the beacon game of our small congregation. Our personal inclination towards historicity and desire to further explore the richness of the system has led us to develop a set of variant rules and cards. They respond to some aspects of the game that we felt suffered from inaccuracies or omissions. Several of these minor inconsistencies have already been spotted by the gamers’ community and addressed in a variety of ways. Our production is merely another proposal, but it is well documented historically and has been thoroughly playtested. A significant effort has been made to preserve the coherence and balance of the game as a whole. A number of cards have undergone modifications in effect, some of them substantial. The whole set has been meticulously redesigned, for homogeneity. A rationale for all substantial alterations is provided. We welcome any questions, comments or feedback. Check our Forum. The BEF Army sets up on its reduced side in the Cambrai space (it may never be rebuilt to full-strength). I believe the BEF is overrated. On its first meeting with the enemy, it indubitably achieved a defensive tactical success due to superior fire drill and good weapons, and forced the Germans to a temporary halt. This episode, however, is of no significant relevance in the strategic scale of PoG, for soon after, the British contingent was thrown into a headlong retreat. Nevertheless, the BEF’s initial accomplishment seems to have inflated out of proportions in some imaginations - with the help of a little pro-Commonwealth chauvinism (present in other elements of the game as well). Granted more total Strength points and Loss factors than a full German Army, the BEF would theorically be able to hold off the whole first Army of von Kluck indefinitely, with actually more chances of pushing the Germans back into Germany than being dislodged by them. Not mentioning if on top of that it benefits from a Trench in Brussels ( !) as per the original set up. This was in reality completely beyond the power of the British force. As another undesirable effect of this overestimation, the BEF tends to linger on the map until quite late in the game. Historically, it was incorporated by the first reinforcing regular British armies, and so shouldn’t even be present on the map at the same time as these. I have placed the BEF in the Cambrai space. First, it cannot be attacked on the very first round of the game, which makes sense since British forces weren’t engaged when hostilities broke out, and will leave some latitude for the Allied player about where he wants to engage his expeditionary contingent. Second, its first engagement was in Mons, halfway between Brussels and Cambrai, so a defensive success would have preserved Cambrai, but certainly not Brussels, overrun without much combat during the opening stages of the war. Check the map. I also chose to flip the BEF over to its reduced side, making it a respectable force still, but no longer capable of fending off a whole German Army by itself. It will also be removed from the map quicker (absorbed in upcoming regular formations). The Belgian Army sets up in Brussels. Antwerp is a 11.1.9 restricted space. The “at start” placement of the Belgian Army in Antwerp does not, of course, represent its initial deployment. Rather, it represents its withdrawal towards the fortress when it appeared that it could not hope to oppose effectively the Germans’ main offensive thrust. However, a war starting without “Guns of August” as its the opening move probably suggests that the German High Command has opted for a shorter hook through Belgium, in order to outflank and attack the bulk of the French forces facing Alsace-Lorraine (it is what Joffre thought they would do). With less pressure upon the Belgian Army inland, and with the Liège forts able to contribute effectively to the country’s defence, precipitate retreat would not have been imperative. I have therefore chosen to place the Belgian Army in Brussels, making its relocation in Antwerp a function of the “Guns of August” card. The Germans were focused on their thrust towards the heart of France and simply bypassed Antwerp. Only when the Belgian army conducted sorties did the Germans plan to capture Antwerp in order to remove the threat on their flank and not until the “race to the sea” was opened did they actually attack it. For that reason, I have included Antwerp in the 11.1.9 restrictions. The Brussels space contains no Trench. The Strasbourg space contains a CP Trench level 1. There is little need to justify these modifications, since they have been proposed by Ted Raicer in his own historical variant. There is no connection between the Trent space and the Verona space. When Italy enters war, Italian set up comprises a Trench 1 in each of Asiago, Udine, Maggiore and Venice. The Italian 1st Army is set up in Venice. The representation of Italy’s participation in the conflict is probably one of the most problematic aspects of the game, and rare are the PoG veterans who do not play with an amendment. In real history, Italy’s entry was ardently desired by the Allies and dreaded by the Central Powers. In PoG, artificial VP penalties are needed to force the Allied player to bring in its Mediterranean ally. It provides the CP with easily accessible Victory locations –the Italian forces can be walked over as soon as they appear- so it could benefit the CP cause more than anything else. The Allied countermeasure in the game requires the transferral of at least a whole army to Italy as soon as it enters the war, which is historically scarcely plausible, because the other members of the Entente considered the Italian theatre of operations as a totally secondary front and had no man to spare for it, and Italian exacerbated national pride wouldn’t have allowed it anyway. The puny offensive capability of the Italians is accurately represented, but their defensive staying power, however mediocre in reality, is underrated in the game. Map rationalization gives them clear spaces to defend in, but in reality they had a good bit of rough ground to cling on. In addition, mountainous terrain on the Austrian side made any exploitation of offensive successes against the Italians a logistical nightmare. To rectify the problem, I chose to set up the Italian armies in level 1 Trenches, so their defensive strength is increased without boosting their offensive power. This is a widely spread house rule among PoG players. I also shortened the front by removing the connection between Verona and Trent, a zone that saw no significant action in reality, for a number of good reasons, but that, in the game, constitutes a tempting avenue of invasion against an overstretched Italian. The trench in Venice represents the Piave line, and prevents a quick, unrealistic, CP sweep into Venice. As a counterpart, Allied intervention options in Italy have been greatly reduced. Remove the German corps from Insterberg and place it in Danzig. The original setup of German units in Prussia does not, in my opinion, properly reflect the historical situation. With 7 combat factors, the 8th Army’s in Insterberg presents a very strong front to the Russian 1st Army. The German forces are however in no immediate position to Flank Attack a Russian 2nd Army invading into Tannenberg. Thus, if the 2nd Army moves first, (likely - since in the case of a “Guns of August” opening, the Allies get the first chance to use Operation points) it will get an opportunity for a coordinated attack (with the Russian 1st Army) against Insterberg before the Germans can Flank attack it. In reality, German 8th Army did not hold such an advantage over the Russian 1st Army. To the contrary, the Germans gave ground to the Russian 1st Army and lost the battle of Gumbinnen. However, the Germans’ asset lied in their ability to swiftly redeploy, outflank and neutralize Russian 2nd Army before it had a chance to synchronize offensive efforts with 1st Army -a difficult task considering both Army leaders mutual aversion. In order to represent this, the set-up was modified : German forces are less concentrated, making them less invulnerable to frontal assault, but are in a position to respond swiftly to outmanoeuvre attempts with Flank Attack opportunities. There is no Mandatory Offensive die roll on turn 1. 4.3.2 Shuffle the 14 Mobilization cards and deal 8 cards to each player. To reduce bad luck impact, and since the original deck of fifty-five cards has been augmented by an additional 3, the card hand is increased by one, to a total of 8 cards. The first time in or before 1915 the CP win a combat against the Paris space (that is, cause the higher loss number on the CRT), regardless of outcome, add 1 VP. The first time in or after 1917 the CP win a combat against the Paris space (that is, cause the higher loss number on the CRT), regardless of outcome, add 1 VP. these VPs are cumulative. The first time an Allied unit is adjacent to Berlin - at any time during owner’s turn - subtract 1 VP. If at the end the game Paris is not CP-controlled and supplied and the CP player has not played the “Friedensturm” Kaiserschlacht card as an event against a space in France or Belgium, subtract 1 VP. If at the end of the game the Allied player has not conducted at least one attack with a US army, add 1 VP. 5.5.2.2 No treaty of Brest-Litovsk Event: VP total 11 and 12 converted into a Draw. 5.5.2.3 Paris CP-controlled and supplied at the end of the game: VP total 8 and 9 converted into a Draw. The first two cases reflect the psychological impact of having had Paris (or, less likely, Berlin) within gun range. In early war such an auspicious military situation could have given the dominant side an enduring moral ascendancy over its cornered foe. In late war it could have weighed significantly in the armistice negotiations. These VPs are mainly included to provide an incentive for the the CP player to push towards Paris in 1914 and during the Kaiserschlacht Offensive, through the historical route of invasion via Château-Thierry. Under the original game’s conditions, such plan would generally be pointless. The two last cases provide incentive to comply to historical imperatives that are too easily ignored in the game: on the Allied side, the urge to have the American troops relieve the exhausted French and British forces on the front line, and on the German side, the one last desperate spurt of offensive ambition before acknowledging defeat. G.1 Each player draws cards from his Draw pile to bring his hand to 8 cards. G.2 Fall 1916 : At the end the Fall 1916 turn (game turn 11), players who reached Total War must discard all unplayed cards from their hand, with the exception of “Grand Fleet”, which may be discarded or not, and "Hoch See Flotte sorties", which may not be discarded at all. Following the excellent principle of period sub-decks, I felt it was necessary to create a “late-war” sub-deck, as some events were characteristically linked to the prolongation of the conflict, and an early play would be both harmful to play balance and historically inconsistent. For simplification, I simply chose to add to these cards a “playable only in or after 1917” restriction. To prevent players from systematically keeping their best “17+” card in hand so that they can play it immediately as soon as they hit the year, no cards can be kept in hand at the end of the Fall 1916 turn (except “Grand Fleet” and "Hoch See Flotte sorties": see the rationale of the card changes). If at least one unit of a nationality under Mandatory Offensive obligation starts an enemy Action Round adjacent to an enemy unit, and at the end of that Action Round, no unit of that nationality is adjacent to an enemy unit any more, the Mandatory Offensive requirement is immediately considered fulfilled. I added this rule to prevent players from inflicting the harsh VP penalty on the enemy by breaking off contact with the units bound to a Mandatory Offensive, so that their attack obligation cannot be met. This can mainly happen with TU MOs, and occasionally with AH or IT. 9.2.8 The Operations are conducted in three phases: Movement, Combat and Reserve. After all Activated spaces are marked, the Active player may move any units which begin in a space marked with a Move marker. Remove the markers from the spaces from which movements were conducted. This constitutes the Movement Phase. 9.2.9 After these movements are completed, the Active player conducts any Combats that he wishes. Remove all attack markers. This constitutes the Combat Phase. 9.2.10 After all Combats have been completed, the Active player may move any units in a space still marked with a Move marker. These units may not move into uncontrolled spaces. They may enter besieged enemy Fort spaces. They may end their movement in spaces previously marked with Attack marker. This constitutes the Reserve Phase. Moving units may not end their movement in a space containing an Attack marker. This restriction was, I suppose, mainly intended to prevent units from moving under an Attack marker and then attacking in the same round. Since movement always precedes combat, this also incidentally prevents a player from simply reinforcing a space from which he just conducted offensive operations. Considering the space and time scale of PoG this is in contradiction with the realities of trench warfare: during large-scale assaults, combat units were continuously fed to the front line as replacements without affecting the pace of offensive action. Conducting movement after combat will permit exploitation of breakthroughs if reserves are available, or reinforcement of attacking stacks depleted by high losses. To prevent improper manoeuvres (such as using full movement to infiltrate through a gap punched during the Combat phase of the same turn), Reserve Movement is limited to controlled spaces only. Within the same operational round, it will allow the planning of an attack to be considered both in terms of immediate assault, and feeding of the offensive effort for subsequent action (a crucial notion in WW1 offensive warfare), rather than splitting the process over several turns in an “attack” / “enemy reaction” / “move replacements into position” / “enemy reaction” / “attack again” sequence. It will introduce more flexibility in the planning of operations and therefore an element of sophistication in their management. 9.5.2.5 Neutral Entry Event Cards may only be played ONCE for OPs, RPs or SR. If a Neutral Entry Card is played a second time it must be played as an Event. It may always be treated as an unused Combat Card and be discarded under the provisions of rule 9.5.4.6. Use a reduced corps of the appropriate nationality in the Capital space as a reminder marker. Without some sort of restriction, the card system made it clearly too advantageous to delay as long as possible the entry of allied nations, in order to benefit from the continuous recycling of their strong card, which makes very little sense historically. I have chose to replace the original and fairly artificial penalties concerning Italy with a simple “playable only once as a non-event”, and extended it to all neutral entries. 9.5.3.5.1 Whenever the MEF Army enters the game on the MEF Beachhead Marker, place the "Beachhead-to-Nowhere" marker 3 turns ahead on the game turn track. (Thus if the MEF card is played during the Spring 1915 turn and the MEF Army is placed on the MEF Beachhead Marker, Place the "Beachhead-to-Nowhere" marker on the Winter 1915 turn box of the game turn track). At the beginning of the turn marked with the "Beachhead-to-Nowhere" marker, place the marker on the map, on on the MEF Beachhead location. While the "Beachhead-to-Nowhere" marker is on the map, whenever a British Mandated Offensive is rolled, immediately increase VP total by one. The "Beachhead-to-Nowhere" marker is immediately removed from the map or game turn track as soon as the space adjacent to the MEF Beachhead marker becomes Allied-controlled. The "Beachhead-to-Nowhere" marker is immediately replaced on the game turn track, 3 turns ahead, as soon as the CP regain control of the space adjacent to the MEF Beachhead marker, unless it was permanently removed previously. At the cost of 4 SR points, the Allied player may conduct a MEF Evacuation: If still in play, permanently remove the "Beachhead-to-Nowhere" marker from the game. If the MEF Army is still on the map and drawing supply solely from the MEF Beachhead location, remove it from the game and substitute it with a BR or AUS corps from the reserve box (if available). The substituting corps and all other corps that draw supply solely from the MEF Beachhead location must then either be destroyed and placed in the Eliminated Box, or, if currently occupying the MEF Beachhead location, immediately Strategically Redeployed to one or more other eligible ports . Conducting a MEF Evacuation is the only way to permanently remove the "Beachhead-to-Nowhere" marker from the game. Elimination of all Allied units drawing supply from the MEF Beachhead, or CP control of MEF Beachhead location, does not affect the "Beachhead-to-Nowhere" marker. The amendments might seem too long for the somewhat marginal importance of the MEF landing episode, but the unhistorical development allowed by the original rules can have a very detrimental impact on the fragile balance of forces in the Near East map. In reality, once the failure of the Gallipoli expedition had become obvious to all, nothing could justify the drain of resources and logistical ordeal necessary to maintain these culs-de-sac. The stranded MEF became such a political embarrassment that, 8 months after its arrival, evacuation appeared as the only viable option. However, under the original rules, the MEF is allowed to linger on the beach ad infinitum and without the slightest penalty. To the contrary, by doing so, the Allied player can tie down an important fraction of the TU forces until the very end of the game. The variant rule simulates the political and military liability (in game terms, potential VP damage) of a prolonged, unjustifiable MEF presence on the Turkish beaches. at the end of the turn, no Allied attacking unit has advanced into the defender’s space in France, Belgium or Germany; or no FR unit attacked this turn. When French Mutiny is in effect, FR MOs on subsequent turns become “None”, and if any FR unit not stacked with a US unit attacks a space in or adjacent to France or Belgium, add 1 VP for the turn (not for each attack). Additionally, no French units may be Strategically Redeployed out of France while French Mutiny is in effect. At the end of any turn, permanently cancel “French War Weariness” if in effect (no French mutiny will then possibly occur) or permanently cancel the effects of French Mutiny, if currently applying, if at least one FR, BR, US or Belgian unit currently occupies a space in France, Belgium or Germany that was CP-controlled at the beginning of the turn, and no CP unit currently occupies a space in France or Belgium that was Allied-controlled at the beginning of the turn. AUS, CND and PT corps count as BR for the purpose of this rule. Immediately and permanently cancel “French War Weariness” if in effect (no French mutiny will then possibly occur) or immediately and permanently cancel the effects of French Mutiny, if currently applying, if "Everyone into Battle" is been played as an event. Historically, the French Mutiny was prompted by the disastrous failure of yet another grand offensive, added to the strain of a protracted indecisive war. In the original rules, the representation of the mutiny is very abstract, both in its causes and effects. It is correlated to no particular circumstances, so a lucky CP draw can spark off the French Mutinies as soon as Total War is triggered (frequently 1915), and even if the Allied military situation is very auspicious. The discontinuity of the effect (on the average, one turn on every three) has no correspondence whatsoever to historical reality. In reality, the mutinies completely took out the Army’s offensive capacity, until it later regained confidence due to positive changes in leadership management and military situation. The variant approach to the question introduces “War weariness” as a prerequisite, linked to both military stalemate and war duration, and triggers the actual mutiny on the occasion of a failed offensive. Its effects will then be continuous until morale is boosted by the improvement of the general military situation. Kaiserschlacht CC may only be played against a space in Germany, Belgium, France, Austria-Hungary or Russia. No Kaiserschlacht CC may be played against a space in Belgium or France unless “Brest-Litovsk Treaty” has been played as an event. In addition to the “Brest-Litovsk” prerequisite, no Kaiserschlacht CC may be played against a space in Belgium or France unless “von Below Offensive ”or “von Hutier Offensive” has previously been played as an event, even if no combat actually occurred, or if a Kaiserschlacht CC have been previously played against a space in Russia, even if no combat actually occurred. Place the “Stosstruppen battle trial” marker on the map as a reminder. When the first Kaiserschlacht CC is played against a space in Belgium or France, place its corresponding marker on the turn record track. Subsequent Kaiserschlacht CC against a space in Belgium or France may only be played during the same or subsequent turn. No Kaiserschlacht CC may be played against a space in Russia unless “Hoffman” has been played as an event. No Kaiserschlacht CC may be played on the Winter 1919 turn. If at the end the game, the CP player has not played the “Friedensturm” Kaiserschlacht card as an event against a space in Belgium or France, subtract 1 VP, unless Paris is CP-controlled and supplied. A key feature of the Great War, the Kaiserschlacht offensives were the product of very specific military and political factors. The victorious peace in the East made the necessary military resources available. But more than anything, it kindled fighting spirit and revived the prospect of obtaining favourable peace conditions through one great, and last, offensive gamble. The slow maturation, through successive trials on the field, of the Stosstruppen tactics, finally gave the German Army the offensive tool to break the stalemate of trench warfare. In April 1918, the starved German Army initiated a series of grand scale desperate assaults against vast portions of the Western front. Success relied on impetus and tempo, for the Allies would be quick at finding a parry if allowed to get their breath back. So, the offensives had to be launched in close succession, until the Army was all but spent, and victory forever out of reach. In the original rules, the consecutive phases of the Kaiserschlacht offensive are dissociated in three distinct cards, which can be played without connection with each other and regardless of military or political circumstances. Their use in the game is therefore rarely consistent with historicity. I chose to include several relevant parameters. The chronological occurrence (the effectiveness decrescendo Michael-Blücher-Friedensturm) must be respected. The new offensive doctrine must be honed through previous battle trial. Germany will have to secure peace in the East before mustering her forces against the West. The last chance offensives can be directed against Russia, in an effort to bring war in the east to an end. However, non-historical (but plausible) use will restrict efficiency. In the West, the offensive cards must be played in within a two-turns time frame, reflecting the tempo needed to retain momentum. 10.1.2.1 A player may voluntarily destroy any of his own corps at any time during his own turns. This can be done in order to make room for other units during movement, SR, or the placement of reinforcements or replacements, or as an emergency measure to obtain reconstructible corps to replenish the reserve pool. Voluntarily destroyed corps are placed in the Eliminated pool. As I have already mentioned, stacking limits are a rather artificial game mechanism. The presence of a corps can sometimes obstruct the arrival of a critical army reinforcement. While it is not infeasible to keep an eye on these details, I felt this “stacking management” lied beyond the scope of realistic simulation and grand strategic thought. I prefer to allow the army in, and consider the corps as absorbed by the larger formation (shoving reinforcements to the front was never a problem during the Great War). This remains a sub-optimal move, as it results in destruction of own troops, so players should only marginally resort to it. 11.1.2 Spaces that were enemy-controlled and supplied at the beginning of the round cost 2 MPs beyond the first one entered. In the original rules, advancing into unoccupied enemy territory costs the same movement points as marching over friendly territory. It is inadequate. In reality, rearguard action of small enemy units, cautious progression due to Fog of War and logistical difficulties would amount to a substantial hindrance of the pace of advance, even if not significantly opposed. But more than anything, in game terms, this has very undesirable consequences, mostly in the East. Abusing from the game-induced sequentiality of enemy response, map rationalization and absence of Fog of War, large sweeping manoeuvres with fast-moving corps can achieve critical mass encirclements. These moves, known in the PoG jargon as “dances of death” and more appropriate for WW2 mechanized blitzkrieg, constitute inelegant and unnecessary sources of rule exploitation, and divert the focus from Grand Strategic thinking. My simple amendment restricts abuse very satisfactorily. The Antwerp space is a 11.1.9 restricted space, similarly to Amiens, Calais, and Ostend. attack a space solely occupied by Belgian units. one of the restricted spaces has been activated for combat. If “Guns of August” has been played as an event, Belgian units may not leave Antwerp before the 11.1.9 restrictions are lifted (if a Belgian unit attacks from Antwerp, it may advance after combat since activating for attack will instantly lift 11.1.9 restrictions). The Belgian Army’s retreat within the Antwerp fortress was an autonomous decision of the Belgian High Command, motivated by self-preservation. Appropriately the Allied player cannot prevent it, but the manoeuvre makes little sense if the Belgian Army is immediately allowed to move out of its (presumably) safe haven (and even worse, out of Belgium). I therefore chose not to permit the redeployment of the Belgian Army before the "race to the sea" has extended the battlefield to the Belgian coastline . 11.2.1.1 After “Entrench” has been played as an event by either side, all spaces in Germany containing at least a German unit, and all spaces in Italy, Belgium, France or adjacent to France, regardless of occupant, receive Trench 0 benefits, unless already containing a Trench 1 or 2. A Trench 0 prevents Flank Attacks and allows the defender to cancel retreat in the same way as other trenches do, and causes one column shift to the left on the attacker’s fire table. Trench 0 may not be brought into play in any other way nor anywhere else, and can never be destroyed but can be temporarily negated by trench-negating combat cards. This is a simplified version of my initial modification. Since the latter required the use of extra Trench 0 counters I abandoned it in favour of this simplified rule, which in my opinion satisfactorily addresses the issue. The variant card triggers the onset of the first stage of static warfare on the whole Western front simultaneously – this is simulated by the inherent Trench 0s. The point of the “inherent and permanent” Trench 0s is to reflect the all-pervading static warfare doctrine and, marginally, the topographical difficulties of the battlefield. It may seem somewhat abrupt, and a loss in simulation accuracy compared to the gradual building up proposed by the original rules. This building up, however, can be very irregular in the original PoG, and with luck playing an undesirably high part in the process, it can take too long to constitute an uninterrupted chain of trenches to cover the whole of the Western front.. At this scale, the historical reality is better represented by an abstract simultaneity, which is the design choice of many other games dealing with the matter. This option still preserves the gradual strengthening of the fortification level (Trench 0 >Trench 1 >Trench 2), through normal entrenchment die rolls. Under the original rules, the removal of Trench 1 counters upon capture had bizarre and inappropriate effects, subjecting portions of the front to intervals of mobile warfare, with sudden Flank Attacks opportunities. These sporadic occasions to revive the fluid war of early 1914 are highly unrealistic: static warfare was not only dictated by the level of enemy fortifications present on the battlefield. Armies had basically become inapt to manoeuvre. In addition, endless shelling tended to turn battle zones into devastated lunar landscape, which limited forward progression to a crawl. The variant also removes the free Trench 1 when the card is first played. Since it is most beneficial to use it on units that not obtain trenches easily through the regular procedure (AH, Serbians, Russians), it turns out that the first units to effectively entrench are often the ones less capable of doing it. While a nice trick in game terms, it is, from our simulationist perspective, objectionable. 11.2.1.2 If at the beginning of the Winter 1915 turn (turn 4), “Entrench” has not been played as an event by either side, the event is automatically considered in effect for the remainder of the game. The CP and Allied “Entrench” cards may no longer may played as events. The "Entrench" event should come in effect by Winter 1914/15 (turn 4) at the latest. The static warfare was not the result of a deliberate decision that could be postponed, or ignored, but a fait accompli resulting from both unpredicted and unavoidable factors (fatigue, logistical strain and artillery shells depletion, uncertainty and bad weather). Some latitude to the simulation can be considered by allowing the process to be sped up –playing the event earlier-, or delayed, until wintertime (turn 4) forcibly brings mobile warfare to a halt. The pursuit of mobile warfare beyond that is not conceivable. I initially believed that resorting to a specific additional rule was unnecessary because the event would typically be played within the historical time span- around turn 3. Experience demonstrated that players would, more often than I expected, slip into Limited War without having played the “Entrench” event. Then, with the card shuffled into a thicker deck and randomness playing its part, the event would only resurface much later, resulting in a very implausible timing. 11.2.10 Whenever a US, British, French or Belgian army fails an entrench roll, place a –1 reminder marker on that space if there was no such marker on that space. Immediately remove the marker whenever there is no US, British, French or Belgian army in the space, otherwise it remains in place. Whenever a German army fails an entrench roll, place a –2 reminder marker on that space if there was no such marker on that space. Immediately remove the marker whenever there is no German army in the space, otherwise it remains in place. All entrenchment attempts in a space with a -1 or -2 marker benefit from the corresponding die roll modifier. On the Western front, entrenchment became a spontaneous routine, and did not require much planning and resource allocation. Considering the time scale of the game (3 months for one turn), entrenchments once attempted should be allowed to reach completion within a reasonable time. Bad luck in the critical CP entrenchment rolls in the West could result in exaggerated delay in the fortification of the front and provide the Allies with opportunities for unrealistically favourable counter-attacks. The Germans were well ahead of the Allies in all domains of trench engineering and much quicker to establish solid fortified networks. They therefore benefit from a superior die roll modifier. 11. 2.12 When there are no unused Trench markers left from his counter mix, a player may remove Trench Markers from the map to place newly created ones. 11. 2.13 Trench capture and conversion is unaffected by the presence of a fort. For movement restrictions, see Nation-specific Rules. 12.1.6.1 Each space can be attacked only once per action round. This is a crucial clarification. Although it is specified nowhere in the original rules, it seems, according to the veterans of the ConsimWorld discussion forum, that the game should be played that way, which is fine for me. This rule has a considerable impact on the conduct of operations on the Western front. 12.5.1 Whenever a combat result calls for a defender’s retreat, the attacker must specify his intention to occupy the defender’s space, and which of his units will do so. If the attacker does not wish to occupy the defender’s space, or is unable to, the retreat result is ignored without penalty for the defender. This is done for each space the defender has to retreat to, sequentially. Representation of retreats must be adapted to the particular scale of the game. It is hard to imagine troops forcefully thrown back 40-100 km (an estimated average distance between two spaces) while still retaining control over that ground because the attacker does not move forward. This is particularly true for the Great War, where distance between enemy lines tended to be quite thin. According to the original rules, stationary, entrenched forces are able to conduct “static” attacks that somehow bounce off neighbouring enemies out of contact. I believe that retreat, conducted on the strategic scale of the game, can only be forced by an attacker’s dynamic pressure, represented by physical occupation of the defender’s previous positions. 12.5.2 If the Combat results call for a two-spaces retreat, the option to cancel retreat (against a step loss) can be exercised in the first space retreated into, if it contains appropriate terrain or a Trench, to prevent further retreat. 12.5.3 The retreat requirement for units that defended in Forest, Mountain, Swamp or Desert is limited to one space maximum. 12.5.4When a retreating unit or stack of units, in accordance to the retreat priorities, ends its retreat overstacked, the excess retreating unit or units may retreat into ONE additional space. Retreat priorities are still to be observed. Only the number of retreating units actually exceeding the limits may exercise this option. Once retreat is completed, if a space is overstacked, the controlling player must eliminate as many units as necessary (not necessarily the ones that just retreated) in order to meet the stacking limits. 1) All retreating units must try and end their retreat in a friendly space, meeting stacking limits. This may imply splitting the retreating stack. Retreat must be conducted through friendly spaces, whenever possible. 2) Into a friendly space in supply, overstacked, or into an enemy space where the retreating unit is supplied at the end of the retreat. Retreat must be conducted through friendly spaces, whenever possible. 3) Into an enemy space where the retreating unit is supplied at the end of the retreat. Retreat must be conducted through friendly spaces, whenever possible. Elimination of entire corps or armies due to mere violation of the stacking limits seems an unnecessarily harsh penalty and it’s difficult to evoke a corresponding situation in military reality. The strictness of the stacking limits are a practical necessity, but rather artificial in terms of simulation. Congestion certainly had adverse effect on battle readiness but plain dematerialization of overstacked units makes little sense. Sadly, players will be tempted to initiate combat in order to force the enemy units into overstacking situations and maximize damage (it is, in game terms, recommended) , and this is where we leave military simulation for pure rule exploitation. Anyway, enemy sectors whose rear areas were crammed with troops rarely provided much incentive for attack. 12.7.1 All remaining full strength attacking units may advance if the defending units retreat or are completely eliminated, within stacking limitations. Exception: a full strength corps resulting from army reduction may not advance after combat in the combat that caused the army to be reduced and the corps to be brought from the Reserve Box as a replacement. Disregard the original rule’s exception concerning undefended forts. This small correction is founded on the principle that if an Army is stopped cold when it has taken enough casualties to be flipped, it should not be able to press forward if it has taken even more casualties –that further reduced it to a corps. 14.3.1 Out of Supply units may be activated on the round immediately subsequent to the enemy round during which they have been placed out of supply, regardless of the turn. They may only be eliminated through attrition after such round has occurred. Thus, CP units that have been put out of supply during the last Allied round of the turn are not eliminated during attrition phase of that phase and may be activated on the first CP round of the following turn. Out of Supply units may only activate for movement or combat so that their movement or hypothetical advance after combat (even if impossible in regard to the CRT) is made towards the closest friendly-supplied space (even if they do not re-establish supply). In case of equidistance, the owning player chooses. For the purpose of this rule (only), Turkish units may consider special spaces defined in 14.1.7 as supplied spaces. In PoG, it is possible for a lone corps to cut the supply of a stack of three full armies, unmolested; the armies will be doomed unless rescued from outside. Of course, things were not that easy in real wars. We have already mentioned that artificial sequentiality of actions and unfailing intelligence of the enemy’s positions made encirclements in wargames far easier than they were historically. In PoG, the disparity is aggravated by the drastic penalties for being put out of supply -instant and hopeless paralysis, depriving the enveloped force of any reaction. In reality, even if the encircling forces could complete their movement without triggering any counter-manoeuvre that caught them off-balance, residual supply always allowed the encircled forces some sort of response, against the potentially overstretched assailer. During the Great War, the considerable risk factor of such manoeuvre, combined with intelligence uncertainties and logistical difficulties, made envelopment an ideal academic model rather than an effectively pursued tactic on the field. Anyway, armies were generally ill prepared for sweeping movements of such amplitude. The only major encirclement that took place was the entrapment of one Russian army in Tannenberg, under exceptionally specific circumstances, and then, it was only a partial one. In a regular game of PoG, however, mass encirclements are not uncommon. The variant approach is part of a general policy for making encirclements less easy. The rules allow for a limited reaction of the encircled forces, so encirclements executed by weak forces against strong opposition are appropriately unlikely to succeed; Encirclements are still possible, but will probably have to be conceived as full-scale, in-depth operations rather than opportunistic raids against a momentary enemy weak spot. 14.3.5.1 Disregard 12.4.4.1. Armies eliminated while Out Of Supply, whether through Combat or Attrition, are permanently eliminated but are not replaced by Corps. Corps are not inherent to Armies (they need to be available in the first place when the army is destroyed). 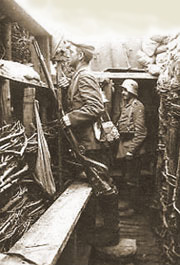 They represent second echelon reinforcements, brought from the rear (the Reserve Box) and moved in during the course of the battle to plug the gap caused by the destruction of the army. Reserves will not be able to take over from forces cut from their rear, in isolated pockets. 14.3.6 Spaces that do not contain an undestroyed fort or a capital that is not enemy-controlled, switch control at the attrition phase only if isolated. A space is isolated if no adjacent space is friendly controlled. Spaces containing an undestroyed isolated fort do not switch control until the fort is destroyed. Spaces containing a uncaptured capital only switch control to the enemy when enemy units move into the space. In my opinion, the switching control of unsupplied spaces needs a little restricting. Spaces in PoG can be rather vast regions, and under the original rules, truly huge geographical areas can abruptly change control while still out of the invader armies’ reach. The “control of spaces changing back and forth from turn to turn”, as explicitly mentioned in the original rules, is to say the least an absurdity. We believe automatic switching should be restricted to pockets of isolated territory, and where bigger regions are concerned, it is not disproportionate to require a minimum of one corps to move through the spaces and secure the area. In addition to undestroyed fortresses, enemy capitals have also been excluded from the switching process, as I consider them to have some sort of inherent minimal resistance factor. Sinai : The Sinai space –3 drm applies to any attack involving at least one attacking unit in the Sinai space or tracing supply through it. 15.1.7.1 Fort destruction resulting from combat losses is only effectively applied if an attacker unit advances after combat through the fort space, or ends the combat in it. If not, ignore the fort destruction result: the fort remains intact. Fortresses were often erected in central locations, at the strategic crossroads of important regions. They could generally be overcome, by assault or siege, only once encircled. While it is possible to occupy the neighbouring area without controlling the fort itself, the opposite is difficult to imagine. A foe that failed to exert firm control over the surrounding land had hardly any means of conquering the fortress. 16.4.3 TSAR TAKES COMMAND: When the CP control two VP spaces in Russia and there is a supplied CP unit adjacent to a AP-controlled VP space in Russia, or whenever the CP control three or more VP spaces in Russia, the Russian Capitulation marker is moved to the “Tsar Takes Command Allowed” box. The CP may now play this event. If the above-mentioned conditions are no longer met and the “Tsar Takes Command” event has not been played, move the Russian Capitulation marker back into the “God save the Tsar” box. When the Tsar took supreme command of the Russian Army, the Germans had not gained control of Vilnius yet. Not before another two weeks would they capture the city. So, in game terms, the CP only controlled 2 Russian Victory Cities at the time of the event portrayed by the “Tsar takes command” card. Per se, it might look like splitting hairs, as one could argue they had pretty much invaded the Vilnius area already, but it seems that, in the game, securing 3 Russian Victory spaces by Fall 1915 is definitely not easy for the CP player. The Limited War Tsar Takes Command event is generally played well into Total War. I chose to readjust the prerequisite conditions to bring the likely occurrence of the event closer to its corresponding historical period. 16.5.4 Each side may only ask for Peace terms once per turn. Once a player obtains a +1 or –1 VP result on the Peace Terms dice roll he may no longer ask for Peace Terms for the duration of the game: maximum gain and loss of VP via Peace Terms is +1/-1 per game and per side. Since VP gain, or loss, through the Peace Terms procedure is, after all, merely a matter of luck, it seemed fair to limit its potential impact on the game. War Plans are the special Mandated Offensives of the opening stage of the Great War. War Plans are in effect only if "Guns of August" has been played as an event. There is one German three-phased War Plan, one French and two Russian. No Allied or CP MOs are rolled for on the MO table on turn one. The PoG designer notes very accurately point out that: “ Not simply the course, but the cause of the war depended on the pre-war plans drawn up by both sides”. Nonetheless, the “Schlieffen plan”, (an inadequate name, but we’ll use it for convenience) is the only pre-war plan to be acknowledged in the rules. Then again, it is only represented through the 11.1.9 restrictions, which are designed to funnel the German advance into its historical axis of progression, and prevent prescient CP player from securing objectives whose strategic value only appeared later, once initial hopes of a prompt decision were gone. These restrictions, however, do not compel the Germans to any sort of aggressive action, so it can sometimes produce strange hybrid effects. The variant rules War Plan mandatory attacks actually requires the German armies to attempt to seize their objective: Paris. 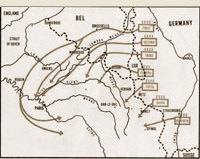 All other pre-war plans are omitted in the original game: the Austro-Hungarian offensives into Serbia (Plan R - after all, that’s where the war broke out) and Galicia; the Russian directive to attack Prussia without delay, justifying 2nd Army’s forward deployment; the French plan XVII, (the attack à outrance into Alsace–Lorraine). The directives of the war plans are simple, though their formulation tries to cover every possible case and might seem a bit intricate at first. Basically, German and Russian plans designate an axis of attack (a three-stage progression towards the capital in the case of the “Schlieffen plan”) and must be implemented unless rendered obsolete by enemy resistance or counter-attack. The French plan consists of a preliminary Mandatory Offensive. I chose to make the French plan a prerequisite ops point expenditure to represent the obstinacy of the French High command to focus on its own offensive, and the subsequent delay before the threat in Belgium was taken seriously. The Austro-Hungarian plan prevents Austro-Hungarian units from falling back and surrendering Galicia without a fight. The opening Austro-Hungarian offensives are represented through the "Guns of August" card mandatory attacks. War Plans can be ignored at the cost of one Victory point –not advisable. The WP is implemented if the Russian 2nd army (or any corps resulting from its reduction) occupies Tannenberg at the end of the turn, or made at least one attack into Tannenberg and was not permitted to advance. a German unit occupies a space in Russia, or. an attack by German units against Russian units clears the space of all its defenders, through elimination and/or retreat. If at the end of turn one, the WP has not been cancelled and has not been implemented, increase VP total by one. an attack by Russian units wins (that is, causes higher loss number on the CRT) against Austro-Hungarian units in Austro-Hungary. WP 1: Plan XVII, "the battle of the frontiers”. The WP is implemented if, as the very first activation of French units, the 1st and 2nd armies were activated for combat in Nancy and both attacked into Metz and/or Strasbourg and at least one of them advanced if permitted. That attack must be conducted with a –2 DRM. a German unit occupies Verdun, Nancy or Belfort. WP 1: Schlieffen plan, “the rush through Belgium”. Applicable on turn one. The WP is implemented if a German unit occupies Sedan or Cambrai at the end of the turn. If at the end of turn one, the WP has not been cancelled and has not been implemented, reduce VP total by one and cancel the WP. Applicable on turn two, only if a German unit occupies Sedan or Cambrai at the beginning of the turn and a condition of implementation of WP 2 or 3 has not been realized yet. German MO rolled on the MO table are not applied. The WP is implemented if a German unit occupies Château-Thierry at the end of a turn. If at the end of turn two, the WP is in effect, has not been cancelled and has not been implemented, reduce VP total by one and cancel the WP. WP 3: Schlieffen plan, “onslaught on the capital”. Applicable on turn two or three, only if a German unit occupies Château-Thierry at the beginning of the turn and a condition of implementation of WP 3 has not been realized yet. Other German MO rolled on the MO table are not applied. The WP is implemented if a German unit occupies Paris at the end of the turn, or made at least one attack into that space, and was not permitted to advance. If at the end of the turn, the WP is in effect, has not been cancelled and has not been implemented, reduce VP total by one and cancel the WP. All rules specific to one country have been compiled in this section, for easy reference. A number of restrictions have been added to the original ones, mainly to restrict the area within which the nation’s units may operate, or to prevent implausible cooperation between age-old foes united by the whims of RealPolitik. The limits were set by taking into account some determining factors, such as the historical sphere of intervention, and foreign policy priorities. Ignoring these restrictions may end up polluting the game with distasteful aberrations such as Turkish corps garrisoning Northern Europe, Bulgarian corps in Baghdad, and so on. IMPORTANT: Spaces that a unit cannot enter via movement or SR are “restricted” spaces. A unit may only end retreat in such spaces if no other unrestricted space corresponding to the same retreat priority level (see 12.5.7) is available. A unit may freely attack into restricted spaces and may advance after combat from an unrestricted space into a restricted space if not specifically forbidden to do so. However, once a unit is in a restricted space (due to retreat or advance after combat), it may not receive replacements, and may only advance after combat into another restricted space, or even, as an exception, move into another one, if the advance or movement is made towards the closest unrestricted space. Austro-Hungarian units may not end movement/SR in spaces in Germany, in spaces north of the line Czestochowa / Ivangorod / Lublin / Kovel / Sarny / Rovno / Zhitomir / Kiev, in spaces in Turkey, nor trace supply through spaces in Turkey. Austro-Hungarian units may not be Strategically Redeployed by sea. Belgian units in Antwerp, Ostend, Calais or Amiens may be treated as British units for Activation purposes (only). Belgian units may only end movement/SR/advance after combat in Belgium or in Calais, or if outside these spaces, towards the closest of them. They may retreat normally. The Belgian Army may be rebuilt in supplied Brussels, Ostend or Antwerp. If “Guns of August” has been played as an event, Belgian units may not leave Antwerp before the 11.1.9 restrictions are lifted (if a Belgian unit attacks from Antwerp, it may advance after combat since attacking will instantly lift 11.1.9 restrictions). The CP may not attack the Belgian Army if it is alone in an 11.1.9-restricted space, until the restrictions are lifted. After "Salonika" and before "Greece Declares War" have been played as events, Bulgarian units may only end movement/SR/advance after combat in a space in Greece if "Hindenburg & Ludendorff Take Command" have been played as an event. Bulgarian units may not stack with a Turkish unit, unless also stacked with a German unit. French armies may never end movement/SR in a space in Italy, nor tracing supply exclusively through Italy. When the AP are in Total War and no CP unit occupies a space in Italy and “Everyone into battle" has not been played as an event, one non-Italian corps may end movement/SR in a space in Italy or in a space tracing supply exclusively through Italy if there were none in such spaces at the beginning of the Action Round. Otherwise, no non-Italian AP unit other than those starting the Action Round in Italy, or in a space tracing supply exclusively through Italy, may end Movement/SR in such spaces. No French units may be Strategically Redeployed out of France while “French Mutiny” is in effect. The French corps in Lyons at the start of the game may not leave Lyons until "Italy Declares War" has been played as an event. For operations on the Italian front, see "Italy". German units may not attack spaces containing Russian forts until the “OberOst” event card is played or the Central Powers War Status is 4 or higher. German units may, however, besiege unoccupied Russian forts. German units may not end movement/SR in spaces in Turkey, nor trace supply through spaces in Turkey, except for one single corps (exception: no restrictions apply to Adrianople). Unless in Total War, German units may not end movement/SR in Italy or Trent, Villach or Trieste, nor trace supply through spaces in Italy. While in Total War, German ARMIES may not end movement/SR/advance after combat in a space in Italy. After "Salonika" and before "Greece Declares War" have been played as events, German units may only end movement/SR/advance after combat in the Salonika and Kavalla space in Greece if "Hindenburg & Ludendorff Take Command" have been played as an event. The invasion of the Allied Salonika sector of “neutral” Greece was a risky political decision and Falkenhayn, less hot-blooded than Hindenburg, had firmly opposed it despite Mackensen’s vehement insistence. I therefore made the Hindenburg & Ludendorff Take Command event a prerequisite for German occupation of the Salonika and Kavalla spaces after an Allied landing if Greece is still neutral. On May 23 Italy declared war against Austria-Hungary. It did not declare war against Germany until August 1916, more than a year later. Until then both avoided provocation. The two countries shared no frontiers, and the Germans abstained from positioning any troops in the Austro-Hungarian territories bordering Italy. In view of that, I have taken up the idea of Ted Raicer’s Historical Variant, which bans German units from Austro-Hungarian spaces adjacent to Italy while in Limited War. British armies may never end movement/SR in a space in Italy, nor tracing supply exclusively through Italy. When the AP are in Limited War and no CP unit occupies a space in Italy, no non-Italian AP unit other than those starting the Action Round in Italy, or in a space tracing supply exclusively through Italy, may end Movement/SR in such spaces. AUS, CND and PT corps count as BR for the purpose of his rule. When the AP are in Total War and no CP unit occupies a space in Italy and “Everyone into battle" has not been played as an event, one non-Italian corps may end movement/SR in a space in Italy or in a space tracing supply exclusively through Italy if there were none in such spaces at the beginning of the Action Round. Otherwise, no non-Italian AP unit other than those starting the Action Round in Italy, or in a space tracing supply exclusively through Italy, may end Movement/SR in such spaces. AUS, CND and PT corps count as BR for the purpose of his rule. No more than one British Corps (including the AUS Corps but not including the BEF, CND or PT Corps) may use Reserve Box SR or SR by sea to or from spaces exclusively situated on the Near East Map. No more than 1 British REP and 1 Allied REP may be spent per turn on units in spaces exclusively situated on the Near East Map. Greek units may not end movement/SR out of Greece, Bulgaria, Turkey, Serbia, Albania or Montenegro. A Greek unit may not stack with an Italian unit. Italian units may not end movement/SR/advance after combat out of Italy, Austro-Hungary, Serbia, Albania or Montenegro. An Italian unit may not stack with a Greek unit. If a CP unit occupies a space in Italy, Italian units may not attack into spaces outside Italy or enter uncontrolled spaces outside Italy, unless by doing so they re-establish supply for an out of supply Italian unit. When the AP are in Limited War, non-Italian AP unit may not end movement/SR in a space in Italy, nor trace supply through a space in Italy, unless a CP unit occupies a space in Italy. When the AP are in Total War and no non-Italian corps occupies or traces supply through a space in Italy, only one non-Italian corps may end movement/SR in a space in Italy, or trace supply through a space in Italy, unless a CP unit occupies a space in Italy or “Everyone into battle" has been played as an event. Whenever a CP unit occupies a space in Italy (regardless of AP War Status) or “Everyone into battle” has been played as an event, one non-Italian corps may end movement/SR in a space in Italy per action round, regardless of other non-Italian units already present, and there is no limit to the number of non-Italian units that may trace supply through Italy. Italian MOs become “none” if Rome is CP-controlled and supplied. Prior to Total War, the transferral of German forces to the Italian theatre of operations, and of French or British forces as a countermeasure, is historically scarcely plausible. Italians and Germans, with no common borders, were not even formally at war before August 1916, and until then mutually avoided provocation. Until their 1916 offensives had ground to a halt, both Germans and Allies still expected to win the war through an imminent decisive victory in France. Both regarded the Italian theatre of operations as a totally secondary front, a peripheral quarrel between Italy and Austro-Hungary, and had no man to spare for it. Italian exacerbated national pride, in its early days, would probably not have accepted Allied assistance anyway. Even well after the advent of Total War, German strategy clearly indicated there was little benefit to be expected from pursuing territorial gains in Italy. 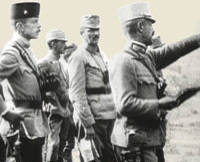 The Caporetto punitive expedition against the Italians was conceived to alleviate the burden on the shoulders of the Austro-Hungarian army, revive failing morale and try out new infiltration tactics. After the initial breakthrough, the offensive stalled on the Mount Grappa/River Piave line and the Germans promptly withdrew their forces and sent them back to the Western front. For their part, and even if some token contingents were present in 1916, the Entente Allies only started considering larger scale assistance to Italy after the Caporetto disaster, as a response to the enemy’s successes. Accordingly, I have limited Allied and German presence within Italy to corps, and excluded armies. (Historically, nominal armies have been present on the Italian front, but are best represented here by one or more corps.) Due to the accrued Ops cost for activating multi-national stacks, Germany and Britain/France/U.S will appropriately abstain from too much involvement in the offensive ambitions of their respective allies on the Italian front. The extent of Allied intervention is restricted, but can increase if enemy forces are present on the Italian soil, or when the Allied forces’ command is centralised within Foch’s hands. Romanian units may not end movement/SR out of Romania, Bulgaria, Austro-Hungary or Serbia. Russian units may not attack, enter, or besiege a German fort during the August 1914 turn. A Serbian unit in Serbia is always in supply. In addition to the normal replacement rules, it may receive replacements anywhere in Serbia if at least one Serbian adjacent space is Allied-controlled. No Serbian unit may be created in Belgrade if Nis is under CP control. Serbian exceptions to rules 14.3.6 and 17.1.3 are disregarded. 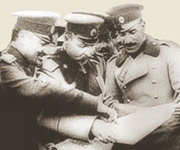 One Serbian Army from the Eliminated Box may be recreated, at reduced strength only, in Allied-controlled Salonika if no other Serbian Army is present on the map. Serbian corps out of Serbia that draw supply from an Allied-controlled Salonika may receive replacements. Serbian armies out of Serbia that do not draw supply from Belgrade may not receive replacements. If there are no Serbian units in Serbia, immediately and permanently remove the Montenegro corps. 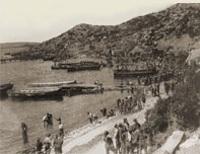 After the Central Powers had occupied their homeland, the battered remnants of the Serbian Army were evacuated to Corfu, where thousands more died from exhaustion, food shortage, and various diseases. Once the landing in Salonika had reopened the Balkan front, the survivors were dispatched to Macedonia, to strengthen the Allied contingent. 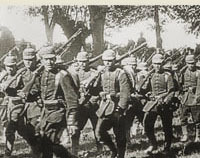 Although still a force to be reckoned with, those Serbian troops were but a shadow of Putnik’s 1914 army, and were completely deprived of any recruitment reserve. Accordingly, I have limited the rebuilding of Serbian forces in Salonika to a maximum of one reduced army. Turkish units may not end movement/SR out of Turkey, Bulgaria, Greece, or the Near East Map. Turkish units may not be Strategically Redeployed by sea, nor to or from a space in Russia. The only non-Turkish CP unit allowed to end movement/SR in Turkey at all times is one single German corps. A space in Russia containing Turkish units costs one additional point to activate for combat or movement. Turkish units may not stack with a Bulgarian unit, unless also stacked with a German unit. Rule 14.1.8 applying to Medina extends to all other Turkish VP spaces excluding Constantinople. CP Trenches stacked with TU units in such spaces do not suffer attrition either. Turkish MO become “None” if 2 Turkish VP spaces or Constantinople are Allied-controlled and supplied. The antiquated Ottoman Army relied on little or no heavy equipment, and its soldiers, accustomed to harsh conditions, survived on nearly nothing. The army was less dependent than regular European armies on a steady flow of supply. To prevent the Turkish presence from completely evaporating from entire sections of the Near East map due to being Out of Supply, which is a little exaggerated in my opinion, I have chosen to consider the meagre Turkish forces to be mostly living off their garrison stocks when in VP locations. 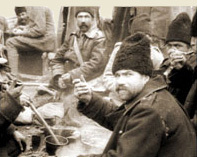 Shortages, without doubt, were endemic, and crippled readiness and morale, but that factor is already computed into the puny combat value of Turkish units in PoG. The Ottoman Army such as it is represented in PoG is already a half-disintegrated army. US armies may never end movement/SR in a space in Italy, nor tracing supply exclusively through Italy. Last version (2004) of the official Path of Glory rulebook. 32 pages. The whole "Banquet des Généraux" variant ruleset, including rationales. 29 pages. Deluxe layout. 31st October 2007. Excel grid, designed to note down progress of uncompleted PoG games using the Banquet des Généraux variant. 28 October 2007.